There has been so much happening here these past months that I haven’t had a chance to check in and write a proper blog post in a while! I love releasing the show and chatting about my projects as it gives me such an awesome outlet to talk about what I’m working on but sometimes, it’s nice to write a little something. Checking in in different ways is a lovely way to keep in touch with my online community without feeling inundated with so much information that I feel overloaded. Do you ever feel that way? I get tired scrolling through Instagram or the copious messages on Facebook (which is why I don’t have an active Facebook account!). I like the assynchronicity of being able to see what people are up to through podcasts and blog posts so that I can take in that information when I am able … I think that makes me a classic introvert but aren’t many of us?! I’ve been waiting a lot this winter. Do you know what I mean? At soccer practice, swimming lessons, piano practice. You know. Waiting. It’s not a bad thing. We’ve definitely entered ‘the next stage’ so to speak. I find myself needing to bring along something I can work on without being too involved so that I can carry on a conversation with other parents and not seem too rude. I wish I could use the time to read (ie. listen to an audio book and knit) but that seems too stand-offish. Do you think so? I tried it once and within about 10 minutes I had the headphones off because I felt like I was sending a certain message that I didn’t want to be involved in the conversation happening around me, regardless of whether I wanted to be a part of it or not. I know that sounds negative. I actually don’t mean it to sound that way – it’s just fact. It’s the evening. I’m tired by that time of the day and don’t particularly want to interact! In the end, I settled on bringing along a simple knitting project that ended up taking the entire soccer season to finish so in that sense, it was perfect! 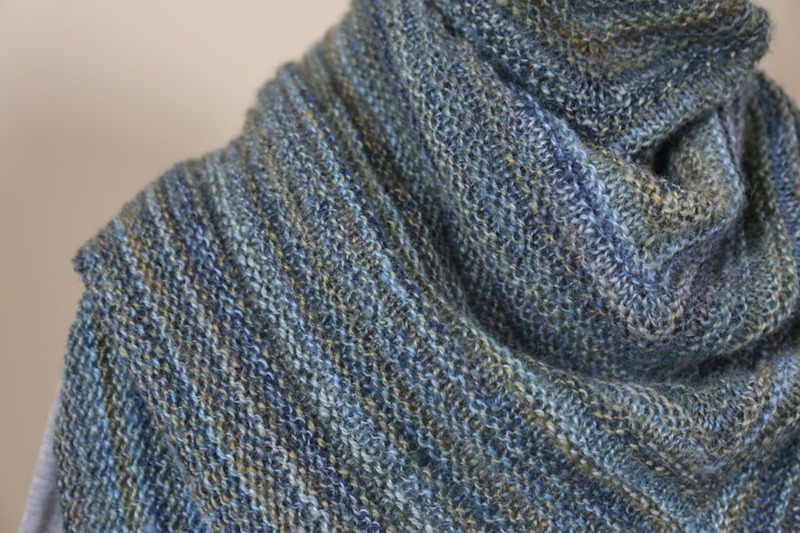 Note the small sections of stockinet stitch between the garter ridges, which offers interest while knitting, as well as when finished! 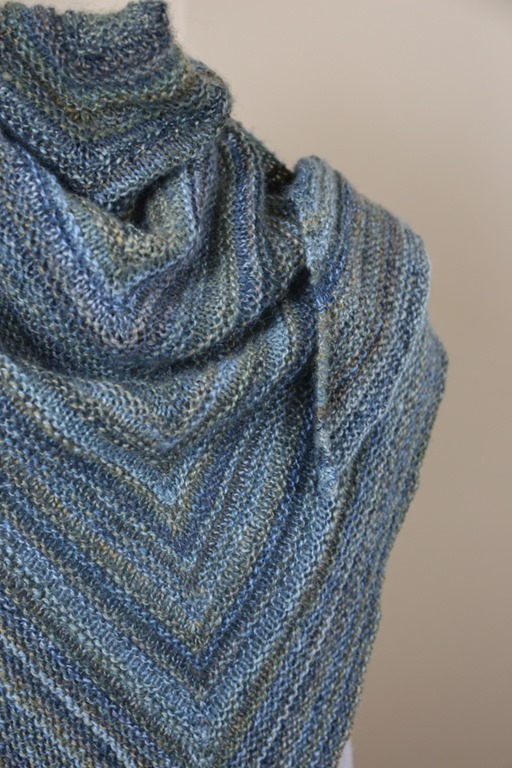 You’re probably wondering how to start the shawl if you’ve read this far! For needles, I used 3.75mm needles but you can work with whatever size you prefer. 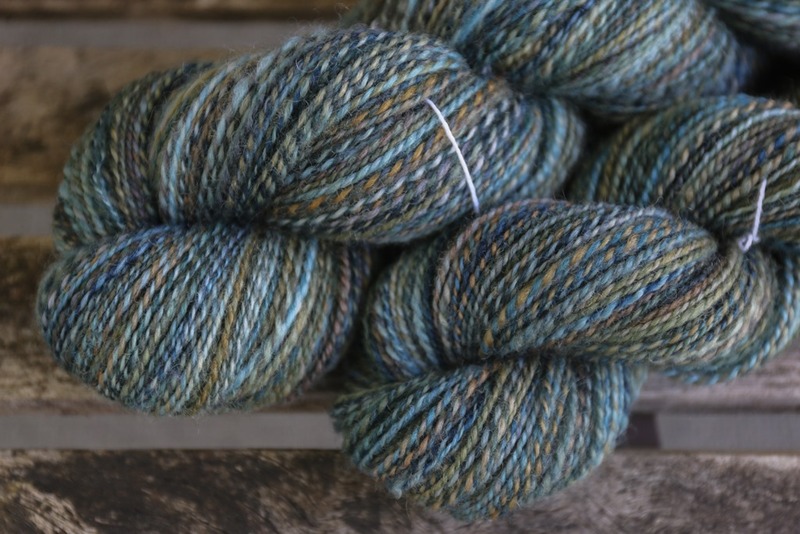 The thicker your yarn, the larger needle size you will want to choose! The finer your yarn, the finer a needle you’ll want to choose. For drape and lightness, ensure you choose a slightly larger needle that you maybe would otherwise. Stitch counts don’t matter because you are just going to work until you have your desired size before starting your garter border. 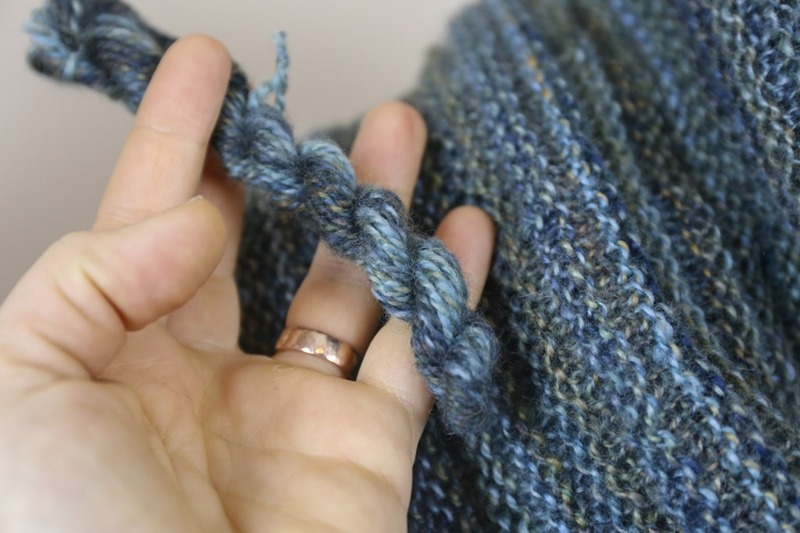 Remember to leave enough yarn to cast off with at the end! 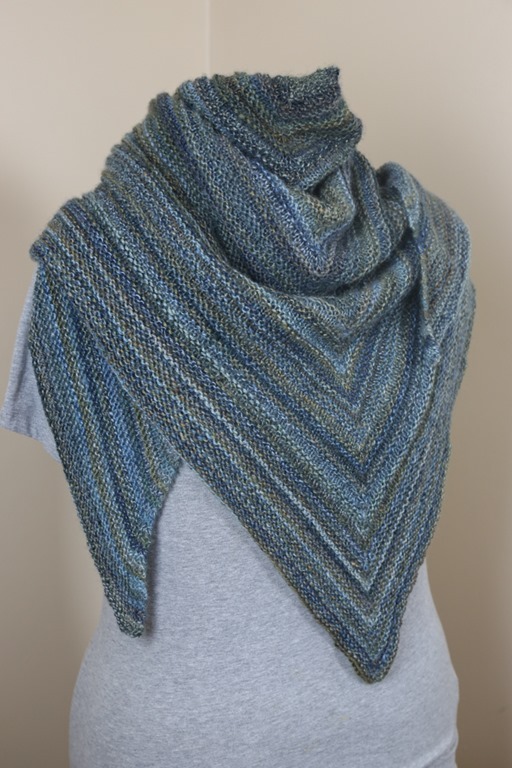 I had 7 yards of yarn left after I finished my shawl but I would have ripped back one row if I’d run out (or found a similar yarn in my stash to cast off with). You can always change to a different yarn for the garter border if you want to maximise your handspun in the first section of the shawl. Really, your imagination is the limit! Cast on 9 stitches. Knit 1 row. Next row (RS), place markers (PM) as follows: K2, PM, M1R, K2, M1L, PM, K1, PM, M1R, K2, M1L, PM, K2 (4 stitches increased). Begin Row 1 above and continue increasing on RS rows of shawl until desired length and size. To finished shawl, work garter stitch back and forth, continuing to increase as above at markers until desired border width. I worked 32 rows of garter stitch (16 garter ridges on the RS) before casting off. I recommend casting off with a needle one size larger that your chosen needles to ensure your cast off is lose enough for blocking. Cast off loosely. To finish, at cast on edge, bring garter edging together and sew together to ‘close’ the shawl at the top and create the illusion of a garter tab beginning. Weave in all ends and block aggressively. If you decide to knit this up, please share your results with me! I’d love to see what you make! Go through your stash, spin something new or just enjoy watching others create their shawls! Any questions, don’t hesitate to comment below. Previous Post Episode 92 Live: Finished Objects! It’s so pretty! And such a simple pattern! 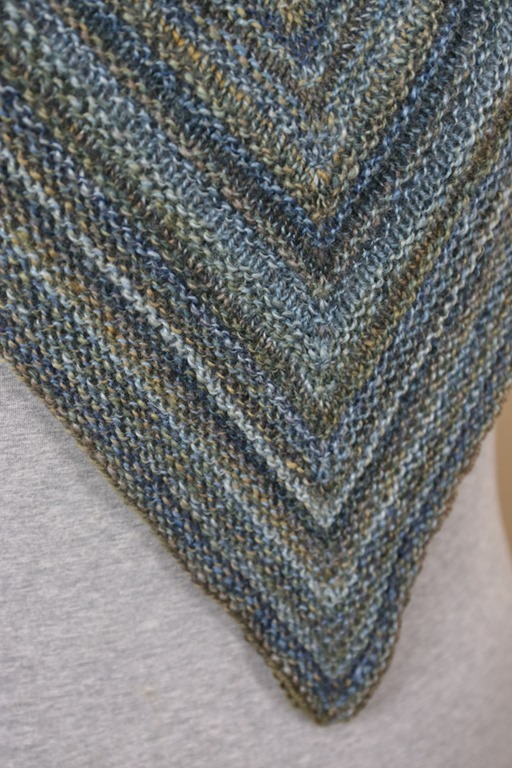 I think that this is a perfect shawl. At my age I am doing a lot of waiting too. With the children, and most of the grandchildren, grown my waiting is being done in hospitals and doctor’s offices. Not usually for myself but, for spouse and friends. It is great to have a design like yours. Thank-you. I’m so pleased! Good luck! Thank you for providing the pattern…perfect for “waiting”. INFJ, here. I was always the Mom coming from work…dressed in corporate attire. No one really chatted with me although I was friendly and approachable…if they only knew in another life I was a stay at home Mom, and still the creative soul. Us INF’s have to stick together!! hahaha I know what you mean. I’m an INFP. Pingback: Strauch Fiber Blog | Strauch Fiber Equipment Co.